Farm Mechanics student of the quarter is Cody Tucker; this is his second year in the program. Cody is creative in the shop, he likes to make things out of our scrap metal and transfer them into unique items. 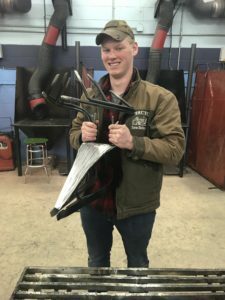 Cody had a chance to participate in the state Skills welding competition getting some great experience and also received some helpful tips from Mr. Tagget, NMCC’s welding program instructor. Cody has plans to join the military after school which will open many more career choices for him in the future, best of luck and stay safe! willingness to help fellow students, and her exemplary manners will take her far in the cosmetology career field. This fall, Meghan plans to continue her studies at Empire Beauty. School in Bangor. Congratulations Meghan!! Mr. Harper has the pleasure of announcing Gabe Herweh as the Drafting and Engineering Technology student of the quarter. Gabe is a pleasure to have as a student. At all times Gabe exhibits exemplary professional behavior and demonstrates an eagerness to learn and share his knowledge and experience. Gabe, uses his strong problem solving skills and a willingness to learn to push outward his understanding and knowledge. Gabe has a determination that is remarkable and will serve him well in the future along with self-reliance and a desire to achieve exceptionalism. Recently Gabe won a gold medal as part of a three-person team competing in the SkillsUSA Engineering Career Pathway competition at the recent state convention. Gabe’s hard work and focus on the many details of a complex project helped to push his team over the top and into the winners’ circle. 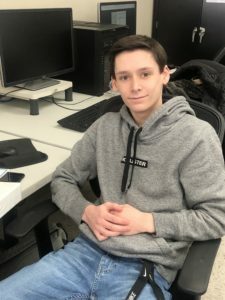 Gabe is also enrolled in MEE-120 our dual enrollment opportunity with the University of Maine College of Engineering and has just completed our Aircraft Design Challenge. Gabe has expressed a strong interest in engineering and we know that with his work ethic and skills he will succeed. Mrs. Lovely’s student of Quarter 3 is Briana Gilson. This is Briana’s first year at PIRCTC and she is loving her time with us. Currently she is enrolled in Principles of Accounting 1, Business Math, Personal Finance, Introduction to Computer Applications, and Introduction to PC Operating systems. 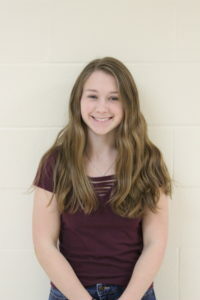 She also spends most of her study hall periods with the business department in order to work ahead in these business classes and offer help to her peers when they need it. 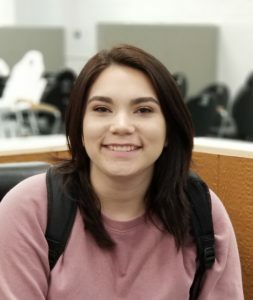 She is happy that she can work in classes that will help her in her future college career in Business Administration through Northern Maine Community College. She will graduate from high school with 14 college credits towards her major. Briana has been a fantastic addition to our class rooms. She is happy to be here and lends a hand wherever she is needed. Often ahead in her work, she will help others with content that they may be struggling in, including students she may not know very well. She is motivated to do well in her classes and maintains her high-honor GPA. Her hard work leaves with her daily as she works most days after school and on the weekends. 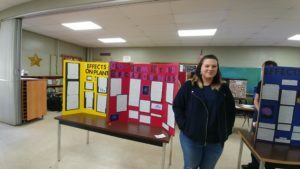 Briana was a member of SkillsUSA this year, competing against others in the state of Maine at the yearly convention. She worked hard on her piece with her teammates, creating content that was clear, well-developed and attractive to others. Briana is a very organized individual with charisma that makes her easily approachable and simply easy to be around. I know she will be a desirable addition to a highly functioning business someday. I am looking forward to seeing her progress. Congratulations on earning Student of the Quarter for Quarter 3, Bree! 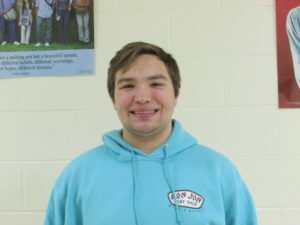 Chance Bragan has been selected as Student of the Quarter for Quarter 3 by Mrs. Gross. He has been a wonderful addition to the AgriScience program this year. Chance has a strong interest in the outdoors and natural resources. 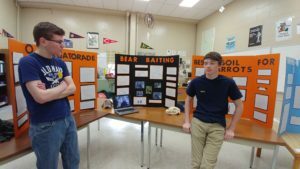 For his science fair project, he conducted an experiment using bear baiting in the morning vs nighttime to determine the best time to hunt. He worked very hard on this activity, and Mrs. Gross and Mrs. McCurry are proud of his accomplishment. Well done Chance! Abby in our science block this year. Mrs. Hunter is pleased to announce Libby Boone as Student of the Quarter for Quarter 3. 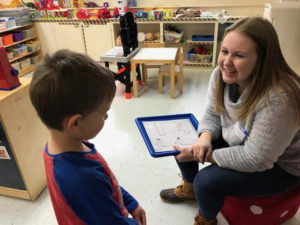 Libby is a first year student in Early Childhood and a senior at PIHS. Libby currently works daily in Ms. Watson’s Pre-K class at Pine Street Elementary. Libby is a huge help to Ms. Watson and is great with the children. She is helpful, energetic and very kind to all of the children. Libby will do anything that she is asked and is eager to assist in anyway. Libby is a star student. She completes her work on time, informs her teachers when she will be absent and always puts forth her best effort. Libby is also a “light” to her classmates. She genuinely cares about her classmates and takes time to get to know them all. Libby’s classmates lean on her for support, a comforting hug, or a good laugh. Libby never disappoints! Keep up the great work, Libby! school every day ready to work with a positive attitude. He is enrolled in the Introduction to Business, Entrepreneurship and Personal Finance classes and maintaining very good grades. attend the University of Maine at Presque Isle in the fall to study Business Management. Nick Amero is Building Trades student of the quarter. Nick is a first year student in the Building Trades program. 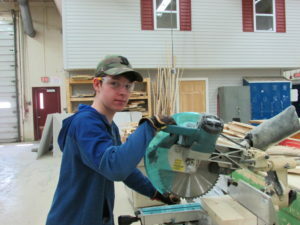 He has proven to be a very dependable and reliable student when it comes to projects in the construction trades. Nick excelled this winter during the masonry segment of the program. Nick works well with all of his classmates and is a hard worker.